Paratransit and ADA agencies need to be able to offer dependable service to their riders and have the ability to report on every aspect of their operation. They need to streamline office work, their means of communication, their data collection techniques and their planning and scheduling procedures. 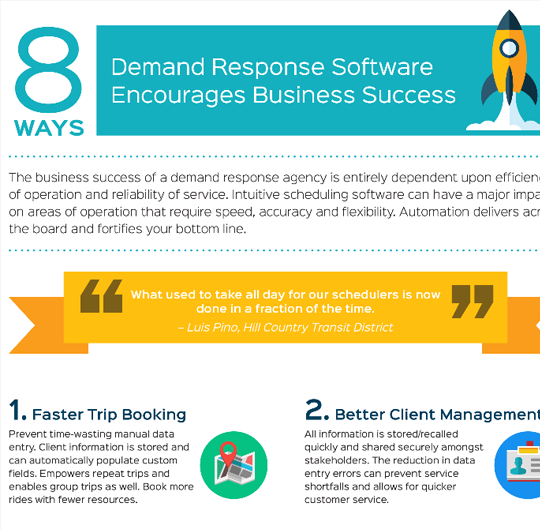 To achieve these service goals, a single-source software solution is needed, one that is flexible and intuitive, yet user friendly and fun to work with. 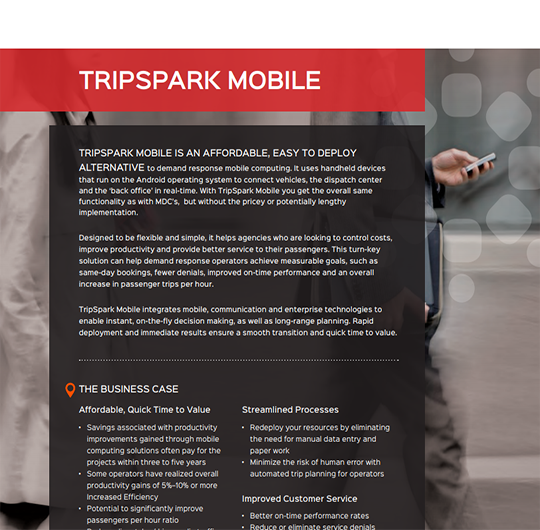 TripSpark's paratransit software employs an industry-leading algorithm, developed for more than two decades and is the robust yet simple-to-use solution to a complicated problem. Our intuitive software schedules accurately and efficiently to deliver every client to their appointments on time. Dispatch can quickly adjust to issues as they develop. Single or batch scheduling happens in seconds rather than minutes. Our unique and incredibly powerful algorithm can also automatically adjust on actual day of operation. Accessing accurate data allows you to customize and create accurate and dynamic reports. Quality reports translates into transparency to your funding agents and auditors. Make informed decisions through analytics that allow you to track all your important information. 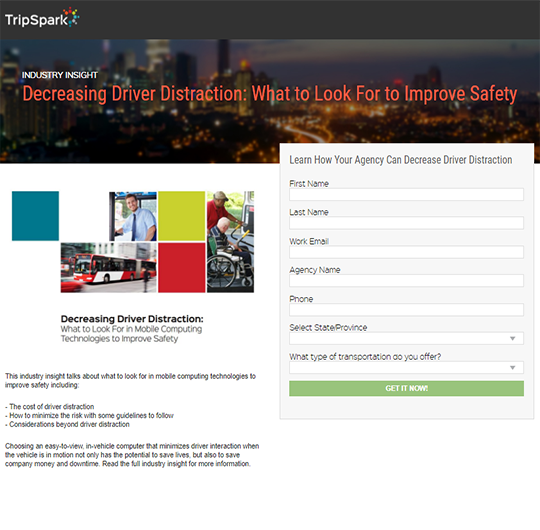 From driver manifests, productivity reports, cancelations & no shows, and more. Improved communication between dispatch, drivers and clients reduces no shows and late cancelations in order to keep vehicle utilization ratios higher. Send and receive live updates to and from your clients and drivers for improved overall service. Updates are pushed to drivers and everything runs smoothly. 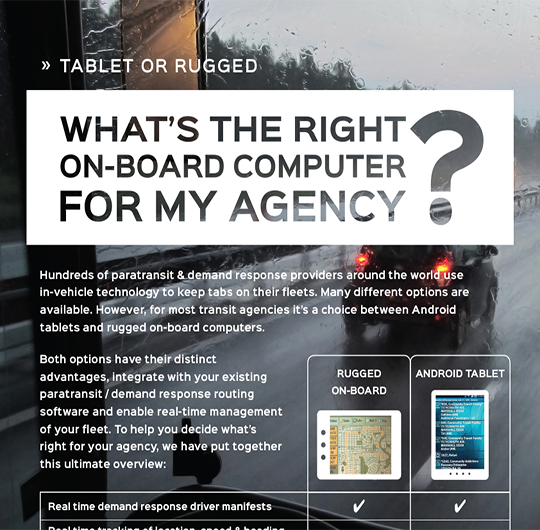 Intuitive and flexible system for scheduling and dispatching trips of any amount. The affordable way to improve rider safety and improve data collection. 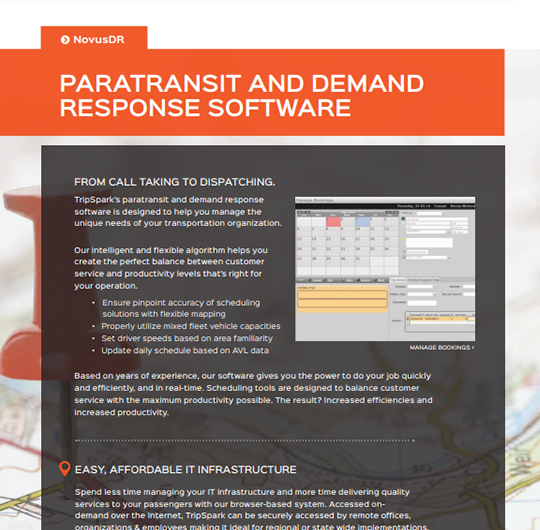 Automate in-bound and outbound communication with riders for improved service. Provide riders 24/7 access and more control over their schedules while relieving call centers. Can Mobile Computing Technologies Improve Safety?